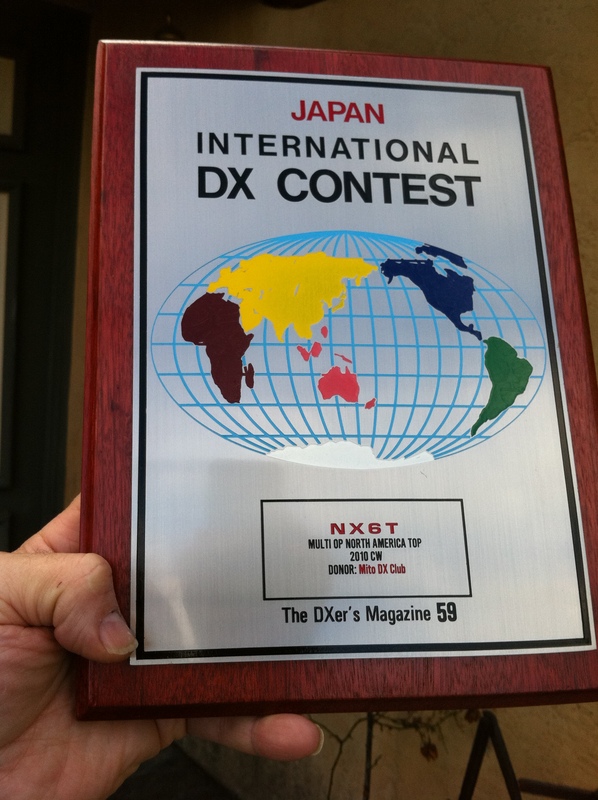 The JIDX CW (code) event is on the 3rd weekend in April - in 2010 NX6T took 1st-PLACE for North America!! - in 2011 NX6T took not only 1st place for North America but the all-time high-score for North America. The JIDX SSB (voice) event is the 2nd weekend in November (between the November Sweepstakes weeknds). For 2010, Joe Rudy and team NK7U beat us to the high score. For 2011 we believe we have a high score but won't know until June 2012. In this competition amateurs from around the world endeavor to contact Japanese amaturs on the standard radio bands from 160-meters (1.8 mhz) to 10-meters (28 mhz). 160-meter contacts are worth 4 points, 10-meter contacts are worth 2 points and contacts on the other bands are worth 1 point. With sunspot cycle #24 well under way 10 meters will give us a lot of points. Here is the highlights from the 2010 JIDX C.w. event (made possible by WQ6X Software). JIDX C.w. 2010 - 1st-Place N.A. Despite a number of visits from Murphy (including an amplifier shutdown), Dennis (N6KI) and Ron (WQ6X) managed a multi-OP 1st place for North America in 2010. 11am - 3 hours after I should have been in bed following the 3am to 8am shift. Unfortunately the relief operator got lost - easy to do in the Fallbrook hills. 2000A amplifier. Mustering 1450w into a 70' yagi-array was a breeze.